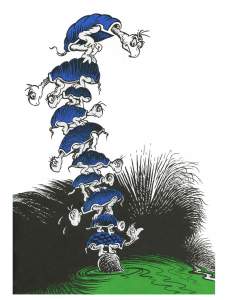 Well, it turns out that Dr. Seuss’s initial impression during the war that you can’t achieve a substantial victory out of turtles turns out to be wrong! This past week, after 3 years or a decade, depending how its measured, the BC Teachers’ Federation scored one of the most substantial court victories in academic and intellectual freedom for teachers in the last thirty years. The victory provides a substantial defense of educators’ civil liberties and free expression, critical education methods of instruction. And what’s more, it is a significant victory for students’ rights to critical content in the schools. The political expressions in issue were messages critical of specific government education policies, contained on posters posted on classroom doors and school bulletin boards, and on buttons worn by teachers. Pursuant to a directive from the school district that political posters and information should not be displayed in school hallways, classrooms, or on school grounds, some principals told teachers to stop displaying the posters and wearing the buttons. This case dates specifically to January 2009, when campaign materials, such as posters and buttons, were circulated by the BCTF to teachers across the province. On 23 April 2009, the Director of Instruction and HR from School District No. 5 (Southeast Kootenay) forwarded a directive principals in the district advising them that the BCTF’s political materials had no place on school grounds other than the staff room. On 1 May 2009, the Cranbrook and Fernie Teachers’ Association forwarded a note to the Director advising that it disagreed with the 23 April directive. Following a grievance filed by the BCTF, an arbitrator heard the case in March 2010 and denied the grievance, awarding in favour of the BCPSEA in October 2011. There was no evidence in this case of any actual or potential harm to students from being exposed to the materials about educational issues, nor any facts from which an inference of harm could be drawn. 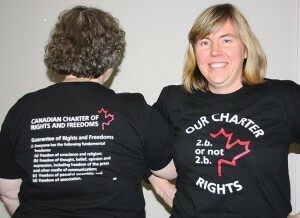 On the contrary, Canadian jurisprudence, including Munroe, stands for the principle that open communication and debate about public, political issues is a hallmark of the free and democratic society the Charter is designed to protect. Children live in this diverse and multi-cultural society, and exposing them to diverse societal views and opinions is an important part of their educational experience. I see no reason why students should receive less protection from the monopolization of the discourse of a societal issue than adults who are subjected to a flood of discourse on an electoral issue by proponents of one side to that issue. In the case of the students, the monopolization on the issue may deprive them of their right to be educated in a school system that is free from bias. Where the issue upon which teachers choose to exercise their rights to free speech is a political one, their rights must be balanced against the rights of their students to an education that is free from bias. That brings into play, as it did in Harper, the concern that if a group is able to monopolize its message on any issue, competing views will be deprived of a reasonable opportunity to be heard…. However, the proportionality aspects of s. 1 of the Charter reserve for another case the evidence required to establish and the point at which teachers’ rights of freedom of expression in schools must yield to the rights of students to be educated in a school system that is free from bias. This landmark decision will certainly be put to test, as the case more generally dates back to over a decade of to-and-fro decisions over academic freedom for BC teachers and their right to free expression. Indeed, one of the best case studies of political speech and symbolic speech is that of the BCTF v. the BC Ministry of Education and BCPSEA from about 2002 to this present decision. Throughout this decade, BC teachers have progressively and systematically tested their rights to political and symbolic speech: posters on school bulletin boards, black arm bands, buttons, letters to parents, t-shirts, bumper stickers on cars in the school parking lot, and wearing black clothes. But down here below, we are feeling great pain. To accent the 11th anniversary of BC government’s oppressive bills 27 and 28, which prevented the teachers from bargaining on issue such as class size, the BCTF and teachers organized a protest for January 28, 2013– a “Dark Day for Education” and “Wear Black Day.” Teachers wore black in their classrooms while the BCPSEA cautioned that “regardless of the colour of attire worn, teachers should not engage students in discussion about their political views.” Some teachers in Prince Rupert responded with new black t-shirts, this time remediating Shakespeare and quoting section 2(b) from the Canadian Charter of Rights and Freedoms. But three teachers were told to remove or cover the shirts. Of course, quoting or paraphrasing one’s civil liberties in defiance has been part and parcel of protests throughout the past 300 years. 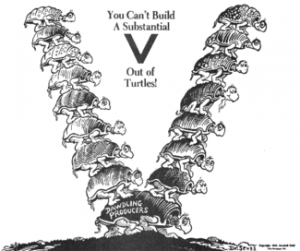 And arguably one of the best political works in the Dr. Seuss catalog, Yertle the Turtle has for five decades been used for purposes of instruction in the classroom and symbolic and political speech, inside and out. Notoriously, the Red Hot Chili Peppers first rocked their expressive version of Yertle the Turtle in 1985. Most recently leading up to the Prince Rupert teacher’s utilization of parts of the text, Yertle the Turtle was used in the protests at the Wisconsin legislature in 2011 and the Occupy movement beginning in September 2011.
it’s about the right of teachers to express their concerns about the working conditions that they teach in and the learning conditions the students are taught in… It’s very important that we as a society encourage teachers to express their views and that we take those views seriously…. You don’t discuss and encourage critical thinking in children by shielding them from diverse views. This entry was posted in Academic freedom, BC Education, Civil Liberties, Ethics, Free speech, Government, K-12 issues, Legal issues, Protests, Strikes & Labor, Students, Teachers, Unions, Working condition and tagged Academic freedom, BCTF, Critical Education, Faculty, Free speech, K-12 issues, Protests, Strikes & Labor Disputes, Students, Working conditions. Bookmark the permalink. Thank you for such a thorough, well-reasoned, nicely-illustrated, charming, principled and refreshingly upbeat interpretation of the Court of Appeal’s ruling and its potentially healthy effects on vigorous public discourse in BC. Nice to see frontline teachers being supported by our compatriots in public, post secondary education. For what is done to us, is soon to come your way as well. It is great to see that the fight for rights is still being gone after by our brothers and sisters to the north in Canada, now for only Americans to charge forward with the same. Now if only the BC Teachers’ Fed would go to such extremes to win any victory for Equal Rights for their equal dues-paying members, the thousands of teachers working on call, who in BC average $12,000 – $14,000 per year because they have absolutely zero protections under 99% of collective agreements. Intellectual freedom is great, but so is eating, and not falling over faint in the classroom. Thank you for bringing this court case and issue to a wider audience. Freedom of speech should concern all citizens. Teachers are paying for these costly court cases out of our own money, while the employer pays out of education budget ( i.e. our tax dollars) that should be going into schools. These are cases which have impact far beyond our classrooms, into society as a whole. “You don’t discuss and encourage critical thinking in children by shielding them from diverse views.” Does this statement apply to allowing an open dialog about one’s personal religious views as well as political views? If we believe in free speech, then we must allow teachers to speak freely about ALL their personal perspectives and beliefs.